Me to Me transfers are here at Kingston Community Credit Union. With this feature members can link their KCCU personal chequing account to their own personal chequing account at any other bank or credit union. Moreover, the service is absolutely free! Yes, you don’t pay us any additional service charges for this feature. Linking the accounts is easy. 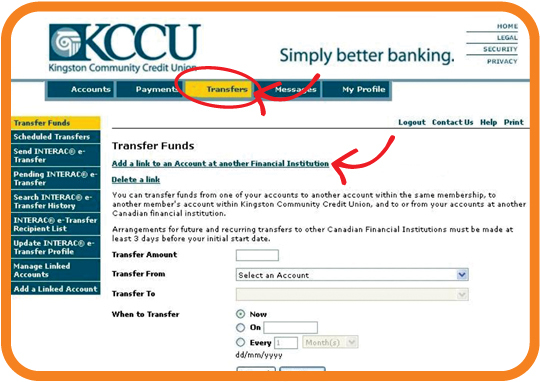 Log into your KCCU ®MemberDirect online banking and click on the “Transfers” tab. Then click “Add a link to an Account at another Financial Institution”. Download the application, simply fill it in and make a cheque from your external account to yourself for any amount, sign it and date it. Send the form and the cheque to the address mentioned on the form or simply hand it in at any of the three branches. Our office will process the cheque to verify the information provided in the form. The cheque should clear, and funds would show up in your KCCU account. Our office will call you to confirm the transaction and the link will be established. Funds can be pushed to the external account or pulled from the external account into your KCCU account. Please allow 5 business days for the funds to be available into your KCCU chequing account in case of a credit/pull funds situation. In case of a debit/push funds, they should show up into your external account within 2 to 5 business days. Any questions or concerns, please call us and we will be happy to assist.